Sunday’s is our club’s Role Play Game and Battleship Game Day! This is to be always a kid friendly net. June 24th to 25th at 7000 Nicollet Ave S.
Starts at 9am on Saturday for setup & cleanup ends about 2pm on Sunday. Field Day is the biggest ham radio event of the year. We need more than people talking on the radio. We need people to log contacts and anyone can do that without getting stage fright. We have loads of activities that never requires a microphone. Today we have already 22 people coming. Please remember no tobacco or alcohol on location. If you only stop for 5 mins that would appreciated. I wanted to answer some questions about Field Day. Can I bring anything to help? Yes, we will need refreshments and coolers (but no alcoholic drinks allowed at any time.) We prefer bottled drinks with lids, & not cans. Any snacks that you want to share or just for yourself. We don’t have any formal Saturday lunch or Sunday breakfast plans. If you want to bring your personal equipment RARC, BARA, and(OR) the City of Richfield is not responsible at any time. We may elect to use or not use your personal equipment if you plan to share it. Recovery or return of your equipment is not the responsibility of RARC, BARA, and(or) the City of Richfield. What is a Gamer in the FD survey? We had last year invited a couple (board game meetup groups) that had help us get additional people during the thin hours. This was suggested by a couple of our members. The gamer’s knew that FD was the 1st priority, and they invited anyone to play with them. We will continue to invite them to run in the background this year. I think we had 6 gamers last year. We will keep it to a small group of players. How many stations will be there? What HF bands are we doing? Station 1 will be doing 75 meters. Station 2 will be doing 20 and 10 meters. Station 3 will be doing 40 and 15 meters. 20m is the busiest HF band and is the most open. 40m is the best when 20m goes dead and the best after sunset and during the night. 75m is for the regional areas of MN, IA, SD, ND, & WI this band can be noisy if storms are around during the night. Please look at Bill’s presentation http://71.195.48.160/~bill/20170606_bara_presentation.pdf. Again, all Field Day activities are kid & family friendly…. Minutes from December meeting approved .Meeting adjourned 2019 CST. Report from Herm on QCWA meeting with program on cyber security. Report from Don on Tech & General Study groups. Lucas had a baby girl. B) Monday call-up net on UHF machine at 6:00 pm CST. Richfield ARC showing CERT & ARC appeared in newsletter with 3 people related to the club in the news. Field Day ( June 24-25 ) 2017 was mentioned. A) Question on location – possibly library location. D) Who can bring equipment ? E) Invite Bloomington ARC, Boy Scouts, and possibility others. Talked about an on the air event possibly in September like last year. Special event station maybe ? “T” Shirts – 3 or 4 possible vendors but only one can do the slash mark on the zero….. Still waiting on more information. Meeting closed at 7:53 pm CST ( 1953 CST ). Just a reminder the Richfield Amateur Radio Club will be holding it’s monthly meeting at the Richfield Community Center at 7pm. All are welcome: Club Members, other Hams and Non Hams interested in the hobby or just emergency communications. Tonight’s meeting will be short and to the point to allow for more time on the activities. Please invite anyone and join the rarcstudy@googlegroups.com if you want to be a new ham or get your General license or to help others to study. We don’t charge any fees. At all gatherings member’s are encouraged to take their own notes & bring a study guide to use as a reference. Anyone may ask questions to the group or any of the Elmer’s at anytime. I am using www.hamstudy.org to sub group the questions. Questions are marked as T1A, T2B, or G1A, G12A (first letter equals Tech or Gen, the number relates to the test number in a group, & last letter defines the group of a type of questions.) All test guides use this same numbering. If you need help to understanding of a question or an idea to share please email it to rarcstudy@googlegroups.com and we will get back to you. We have Elemers in this group ready to help you. This study group is for anyone to learn how to get their new ham radio license (Technician license) &/or to help anyone to learn their General license regardless of affiliations. This is sponsored primarily by Richfield Amateur Radio Club and Richfield CERT team. Sub organizations we support are: Bloomington​ Communications Group, Bloomington Amateur Radio Association, & Minnesota Emergency Preparedness Meetup. 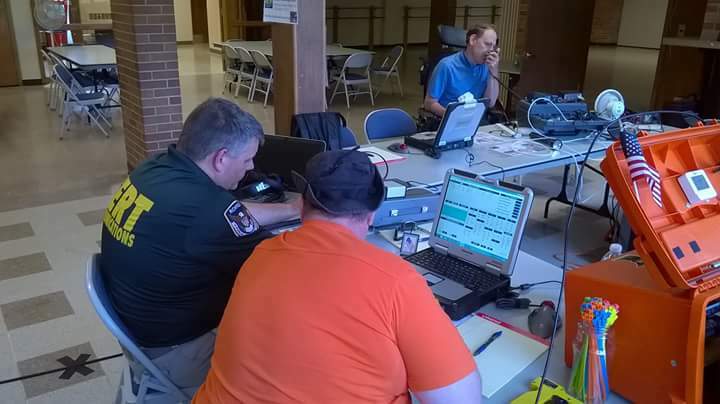 We encourage everyone to support the Bloomington Amateur Radio VE Team for the official testing location per their location to our gathering locations. We don’t require people to take their test to anyone testing group, but we will track Bloomington’s VE’s testing times and fees. Finally our study group is asking everyone to spend 20mins a day to study 14 or less questions by hamstudy.org‘s sub group sets under “Read Questions” the series of G1A, or T1A, and then use the “flash cards” of G1, or T1 under its study sub set. Then work on G2A or T2A series and repeat. Analyzing what the pilot was attempting when something went wrong. From a CAP/Search managers point of view. Interested parties from other organizations are welcome to attend. Next meeting is January 18th Club Elections. More updates will be posted. All posted nominations have been accepted. The President shall preside at all meetings, and conduct them according to the rules adopted. He/she shall enforce due observance of this Constitution and By-Laws; decide all questions of order; sign all official documents adopted by the club, and perform all other duties pertaining to the office of President. The Vice-President shall assume all the duties of the President in his/her absence. In addition, he/she shall organize club activities, plan and recommend contests for operating benefits, and advance club interest and activity as approved by the club. He/she shall maintain close liaison with the ARRL’s local ARES® Emergency Coordinator to further club participation in the Amateur Radio Emergency Service®. He/she shall be the curator of all physical club assets. This responsibility may be delegated to another committee or special position. The Secretary shall keep a record of the proceedings of all meetings, keep a roll of members, submit membership applications, carry on all correspondence and read communications at each meeting. ***In order to make sure every member has a voice we will be doing Proxy Voting. (Proxy Vote is: When a member uses another member to vote for them similar to a Absentee Ballot.) We will be opening the 444.475 repeater for voting during the meeting per our club has no Treasury or any financial gains. On Thursday 12-29-16 we did an “All Call Drill.” I We had 9 check-ins including me as net control. I will give thanks to AE0RF for helping me when it became alphabet soup. I kept saying Zulu instead of Zero, so Justin came to my aide. N0TNL was ready to relieve AE0RF. So I also want to give Matt a big thanks. This was our 2nd attempt of an “ALL CALL! or CLUB ROLE CALL!” on a net night. Our 1st attempt yield a little more results, but we did use 145.390 and 444.475 repeaters simultaneously and gave everyone a longer warning of the drill. I again I thank all that participated. I will also would like to add that I did get some additional emails of members that was not in range of the repeater. This drill or club exercise will be coming again in the new year with little to no warning in prep for a real call out of ham radio operator’s to be use as an immediate support group. If you want to be the net controller or roundtable person please let me know, and I still need a person for next week (1-5-16). Procedures are on this website. ALL CLUB MEMBERS SHOULD ALWAYS MONITOR OUR REPEATERS WHENEVER POSSIBLE!!! I have added frequencies that should be used for Go Boxes or Micro-Shacks. 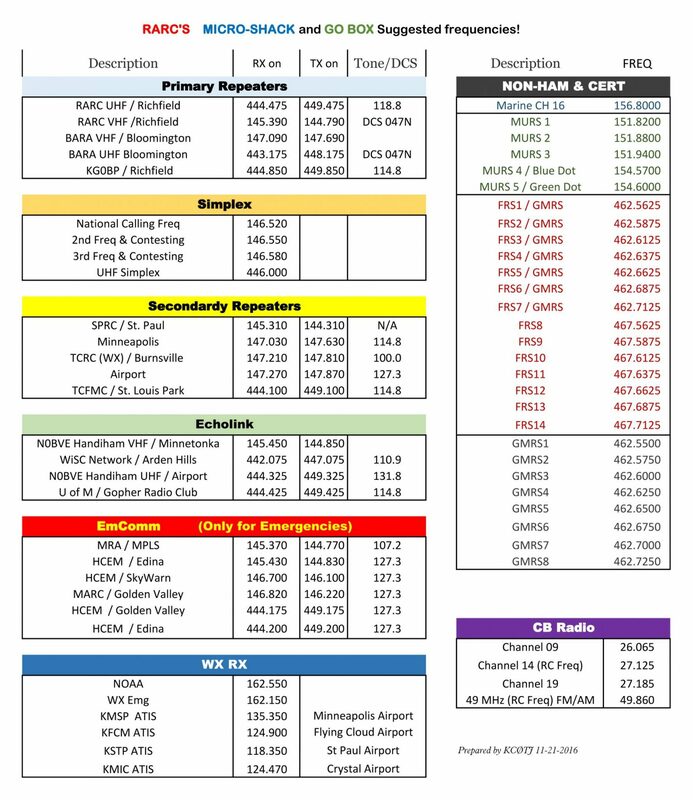 Please note the right side is showing non Ham Radio services like Marine, Multi Use Radio Service, FRS, GMRS, & CB bands and should be for rx only. I also have added Chirp CVS formatted File type that is Excel friendly. One version is everything, and the other version skips CB bands 27MHz & 49MHZ. I have grouped them by categories and added a 6 digit memory tag of everything. RARC & Author is not responsible for any radio damages or activities over the air. This is suggestions based on location of RARC’s Repeaters. RARC & Author only supports this as a resource for a baseline knowledge for it’s members. 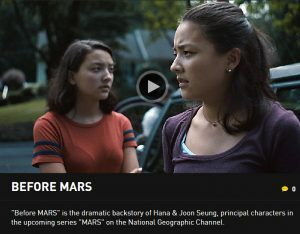 KEØGZT here with a tip for a good upcoming Nat Geo film… and a good Ham-related e-newsletter/blog. The current issue of the e-newsletter Calling CQ is below. The Nat Geo film looks to be a great one. Check out the trailer in the above link. The author of Calling CQ, is Jeff Davis and I’ve been following his blog (different from the e-newsletter) for about a month, plus lots of his previous posts. His blog can be found at Jeff Davis, KE9V. See you at the RARC mtg. next week. Thanks Mike for this information. 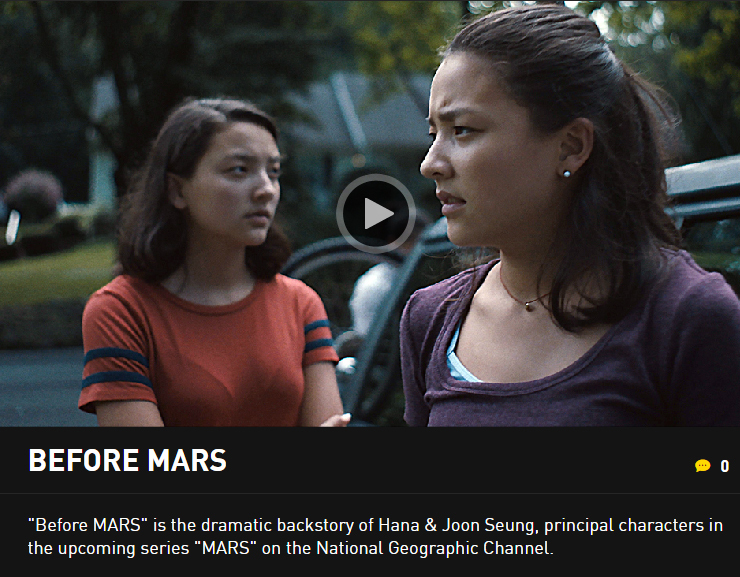 I will be watching this short film.